Kenneth Mandl, MD, was named the first Donald AB Lindberg professor of pediatrics at Harvard University School of Medicine. In a ceremony on March 30, pediatrician and medical informatics specialist Kenneth Mandl, MD, was named the first Donald AB Lindberg professor of pediatrics at Harvard University School of Medicine. Dr. Mandl is a professor of pediatrics at Boston Children’s Hospital where he directs the Computational Health Informatics Program. 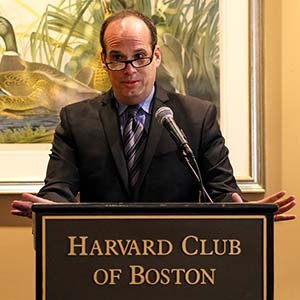 Dr. Mandl also is a professor of biomedical informatics at Harvard Medical School and has pioneered the use of health informatics for biosurveillance throughout his career. For example, Dr. Mandl developed the Scalable Collaborative Infrastructure Learning Health System (SCILHS). SCILHS provides an interoperable health information database that provides inferences about individual and population health. It is used in hospitals in Boston and nationally. In addition, Dr. Mandl is an advocate of patient participation to produce and access health data, which uses crowdsourcing to obtain valuable health information from participating online patient networks. Dr. Lindberg is the director emeritus of the National Library of Medicine and helped found the field of biomedical informatics in the latter third of the 20th century. At NLM, Lindberg oversaw the development of an array of biomedical and consumer health informatics services, including PubMed, MedlinePlus, and ClinicalTrials.gov. Dr. Lindberg was NLM’s director from 1984-2015. Besides the faculty chair at Harvard Medical School, there are programs and awards named after Dr. Lindberg at Vanderbilt University School of Medicine, the University of Missouri-Columbia, and other higher educational institutions. Dr. Mandl previously received the Donald AB Lindberg Award for Innovation in Biomedical Informatics from the American Medical Informatics Association. The celebration of the new Lindberg chair in pediatrics occurred at the Harvard Club of Boston and was hosted by George Q. Daley, MD. Dr. Daley became the dean of Harvard Medical School on January 1, 2017. At the ceremony celebrating the first Donald AB Lindberg professor of pediatrics (left to right) Donald AB Lindberg, MD; George Q. Daley, MD, PhD; Kenneth Mandl, MD; MPH, Isaac Kohane; MD, PhD; and Gary Fleisher, MD. April 18, 2017 in People.